Zippy is a 5 month old, male, unneutered, domestic short hair cat. He has been generally healthy and has completed his kitten series of vaccines and dewormings. He presents about 20 minutes after chewing on a lamp cord. It is not clear how long he was getting electrocuted, but could have been up to a couple of minutes, he had just been chasing his toy. He was found rigid with his mouth around the cord. The owner unplugged the cord and he immediately relaxed and started breathing. He was very out of it initially but by the time he arrived at the clinic he was quiet, alert and responsive. His vitals were normal except for being somewhat pale. On physical examination blisters were found on his lips and behind the canine teeth. There was no charred tissue visible. Otherwise, the physical examination was considered normal. What are the concerns for Zippy and how do we treat? Since Zippy survived the actual exposure to the electrical current, our concerns now are tissue damage from the electricity and non-cardiogenic pulmonary edema (NCPE). When an individual is exposed to electrical current the muscles contract due to what is essentially a continuous nerve signal. So the individual becomes paralyzed. Anything that touches them has the potential to also become electrified. I have seen videos of a person touching a light pole that has a short. He becomes paralyzed and cannot let go. Each person who touches him also becomes paralyzed until there are a string of people that have no control over their bodies. They will stay that way until the electricity is turned off. Therefore, when a pet chews on a cord and is being electrocuted, do not try to pry the mouth open. This only puts you in danger. Turn off the power or unplug the cord. The electrical current has the potential to do several things in the body. It is possible for the current to stop the heart immediately. When this happens the first step is to get the heart going again with cardiopulmonary resuscitation (CPR). If the heart will not restart, other considerations do not matter. If the heart is not stopped, there are 2 main sequellae. The first is electrical burns. The electricity running through the tissues creates heat. (Think of how warm some plugs get when drawing a lot of power.) The heat is created wherever the current is running. These burns can range from mild first degree burns causing redness to the tissue actually catching on fire. It does not take much heat to cause tissue death. Furthermore, the tissue can be slow to show us what damage has occurred. Sometimes we see no evidence of burns at initial presentation, but over the next few days there can be significant tissue death. With Zippy, there is immediate evidence of at least 2nd degree burns. Therefore, we know that there will likely be some tissue death that will need to be dealt with. Pain will be a problem and infection is a consideration. The other frequent problem is what we call non-cardiogenic pulmonary edema (NCPE). This is fluid that builds up in the lungs for reasons other than heart failure. In the case of electrocution, the cause is likely secondary to an extreme catecholamine (think epinephrine/adrenaline) release causing transient pressure changes in the lung blood vessels. The NCPE usually develops 0-2 hours after the electrical insult. The critical time period is 24 to 48 hours. Prognosis depends on the severity of the edema. Mild cases usually do well. Severe cases may not survive. Treatment options are somewhat limited. At this time we do not have medications that will removed the NCPE. (The medications used for the edema caused by heart failure do not work because the mechanism is different.) The mainstays of therapy are oxygen supplementation, control of anxiety and time. Some patients need mechanical ventilation. It is not possible to predict which patients will develop NCPE and how severe it will become. With Zippy's history of electrocution, we recommended hospitalization for monitoring and initial treatment. Initially, we gave pain medications and monitored closely. About 2 hours after presentation he started to breath faster and with more effort so he was started on oxygen. About 2 hours later, chest x-rays were done to confirm what was happening. These showed a pattern consistent with NCPE. Zippy was transferred to the emergency hospital due to his ongoing need for close monitoring and oxygen supplementation. 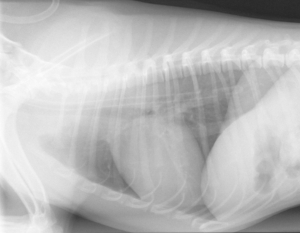 When he left he was starting to show evidence of further tissue death in his mouth. A video of an oxygen cage can be found here. At the emergency hospital, Zippy had continued oxygen therapy. He had severe problems at about 24 hours after initial presentation. It was debated whether to place him on a ventilator, but due to the extreme cost, the owners declined. (A video of a cat in respiratory distress can be found here.) Later in the day Zippy started to breath a bit more easily. He required continued oxygen therapy for about 3 days. During the 3 days, it became obvious that the tissue damage in his mouth was extensive and would require surgery to debride and possibly reconstruct a functional mouth. Zippy was unable to eat while in the oxygen and was too unstable to have a feeding tube placed during that time. Partial nutrition was supplied via the IV catheter. Once Zippy was out of oxygen, he was anesthetized and an initial wound debridement was performed by a boarded veterinary surgeon. At this time he lost about 1/3 of his tongue, the skin over the front half of the lower jaw and most of the left upper lip and nose. He also lost gingival tissue over the left dental arcades. As oral nutrition was not possible, a feeding tube was placed in the neck. Within about a week Zippy was feeling reasonably well again and playing some. The wounds were starting to heal and more dead tissue (bone) was becoming obvious. Ultimately, Zippy had 2 more surgeries. He lost much of the left side of his face, including all the teeth on the left side, all of the incisors and all of the canines. He lost the left side of his lower jaw from the level of his last tooth. He lost some bone on the left upper jaw but most of the palate remains intact. Most of the nose is missing. The feeding tube was kept in for about 3 months when he started to drink and eat consistently on his own. He makes quite the mess when he slowly eats his canned food. However, Zippy is a very happy and otherwise healthy fellow. Zippy was lucky. His injuries were extensive and required a lot of care, time and money. Many owners would have elected euthanasia. Many patients may have died from the NCPE. Many cats would not have adapted to his new life.